Recently the government put Air India up for sale. Predictably, they made the terms of the deal so onerous that there were no bidders. Not only is this an embarrassment for a government already reeling from complicating and destroying a good tax like GST, but, sadly, it also reduces the market price of a very valuable asset. Remember this in context of the fact that Air India has a vast domestic and global network and some of the best routes to key destinations for travellers to and from India. It has slots in prized airports and offers non-stop service to and from Delhi to cities with large India populations. It has a top-line revenue of around Rs 25,000 crore which with proper management can easily be doubled in the next 5 years. In the aviation business, Air India has prized assets. So why were there no bidders for this alluring asset? One word answer– government. If I were to ask my business students to come up with the worst possible way to structure the sale of a government asset, the Air India deal would probably be it. The framework presented to potential bidders highlighted the worst liabilities of Air India –not a very good way to sell anything, much less an airline that is losing close to a billion dollars every year. It is beyond comprehension why the government did not hire professional investment bankers and instead decided to allow bureaucrats, with no experience in financial markets, to structure a deal of this magnitude and importance. Structuring investment banking deals require one to think like a chess player. A series of sequential moves have to be made to add value to the final deal. All good investment bankers know the importance of prepping a deal–”putting lipstick on a pig” is the colloquialism we used on Wall Street for prepping a company for sale. But in the Air India deal the lack of strategic planning on the part of the government is obvious. They just handed the process over to bureaucrats who have never run a business, and have no experience of capital markets, much less structuring win-win deals. As a result, instead of thoughtful planning and making the right chess moves, there was an arrogance to how the deal was structured. Now, by getting so openly rebuked, Air India’s value has been greatly diminished. And as is always the case, it is the citizens of India, who eventually own Air India, will end up paying the price for the government’s failure. Let’s examine what the government should have done. The first move to prepare Air India for eventual sale should have been to bring in professional management to run the airline. 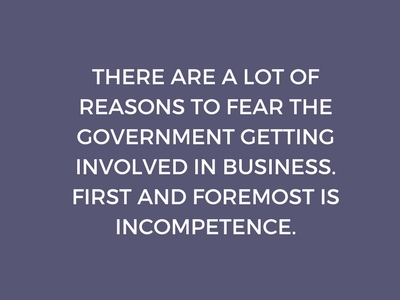 For the longest time, it has been run by risk-averse bureaucrats with no experience managing a business and with no skin in the game. There is no dearth of top-level management talent that would have been intrigued by the idea of turning the airline around. Under the right conditions, namely zero interference from politicians and bureaucrats and the right upside incentives, a good management team would have added significant value to the Air India asset. The second move should have been a reduction in the airline’s labour force. Like the Indian Railways, Air India is a huge employment agency with over 30,000 employees and an annual payroll exceeding Rs.12,000 crores. It has the highest employee-to-plane ratio of any airline in the world. Everyone knows that you can’t run a profitable business by having two people do the job of one. The employment contracts of the 11,000 or so permanent employees should have been restructured through severance packages, voluntary retirement schemes, and employee stock ownership plans. Since these are government employees it is the job of the government to resettle them–no sane investor would take on an investment with so much dead wood. This was a critical step before putting Air India for sale. Finally, the eventual aim of selling Air India is to monetize government assets and bring much-needed capital into the public exchequer. It does not matter who the eventual owners are as long as its full value gets realized. A tender, limited only to a few bidders, is probably the least efficient way of raising capital. A more productive way would have been to sell Air India’ assets by taking it public through an Initial Public Offering and letting millions of investors be part owners of the airline. Breaking Air India free from the clutches of the government and bringing it under the discipline of capital markets would have significantly enhanced the value of its assets. There are three things that affect a business–product, ownership, and management. For all these years Air India has had only one of these three–a good product. What it needs now are new ownership and effective management. By taking it public the government can bring Air India under the discipline of capital markets which will eventually ensure that it gets the best management to make it profitable. The Modi government has rightly decided to infuse capital into the public exchequer by selling state-run companies like Air India. The way this deal panned out should be a good lesson for the future. Corporate restructuring is not a job for amateurs. Realizing the best value for a company’s assets is best left to those who understand capital markets. That is why companies use professional investment bankers to help in structuring such deals. The Indian government would be well advised to leave bureaucrats out of the process if they want to realize the best value for state-run assets. It ruined the Air India deal by arrogantly trying to force a poorly-packaged product down the throats of unwilling buyers. It can still salvage a good value for these assets and also develop a template for future deals if it learns the right lessons from this fiasco.